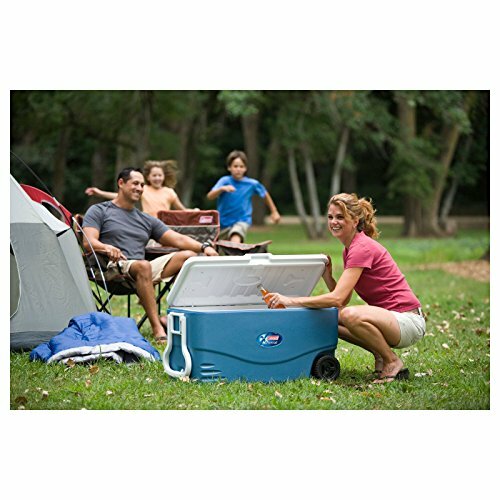 With prime camping, tailgating and vacation season right on top of us, many of us are looking for decent sized coolers with wheels and handles. These coolers allow you to transport your favorite snacks and beverages over distance, keeping them ice cold in warm weather. As a result, they’re the perfect accompaniment to any summer vacation. But with so many on the market, which are the best coolers with wheels? For those of you who don’t need wheels to transport your ice chest checkout these 5 cooler options. Today, we’re going to review three big brand coolers with wheels and handles This article cuts through the marketing jargon to answer a simple question: which should you buy? But before we do read our buying guide below. The price you’re prepared to pay will massively effect the quality of the unit you receive. You’re not going to get a rugged and durable product with quality fixtures and fittings if you aren’t prepared to spend a little. Cut corners on budget and things like the quality of latches, handles and wheels will suffer as the manufacturer will have had less of a budget to work with. This is perhaps the most important aspect of a cooler. You need to prioritize what you’ll be using the cooler for. If you’re using it for a tailgating party then you perhaps only need to cool beverages and snacks for a short period before they’re consumed. If you’re going on a weekend camping or fishing trip you might need 3 or 5 day cooling performance. Better performance will come from coolers with thicker insulation and perhaps a roto molded construction. This specification will come at a premium though. You need to balance your budget for the intended use and required performance. Again this comes down to choosing a product based on intended use. For a small family day at the beach do you really need a huge capacity? Whereas if you’re in charge of the beer for the party you might want to think big. Bear in mind that a cooler with 5 days plus ice cooling performance that holds over a 100 cans will be a bulky unit. The internal and external dimensions might also vary wildly due to the thick insulation required for the cooler to do it’s job. The bigger the unit the heavier it’s likely to be even when empty. Ensure you pick a size that you can realistically handle when full. Large horizontal models specifically can be really weighty when full. Just lifting it can be hard given that the pivot point, around the wheels, is right at the back. 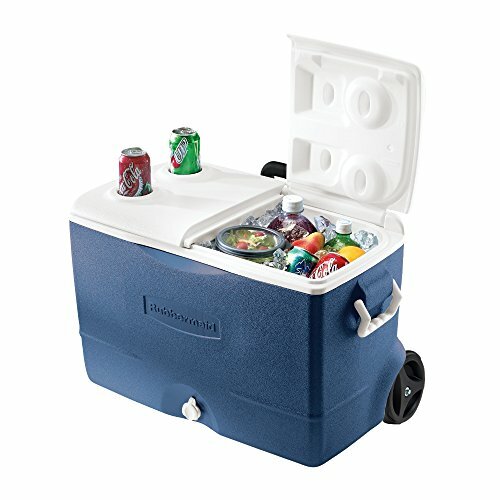 What activities do you plan to use the cooler for? This should dictate whether wheel size is important or not. If you’re just planning on rolling the cooler down to the game then smaller wheels over relatively even surfaces will be fine. However if you’re going camping or to the beach then a unit with bigger wheels that can handle sand, or rough and abrasive terrain is going to be easier to pull along. In this respect you might also want to consider the shape of the cooler. Upright or horizontal? An upright model will feel lighter and will be easier to haul across rough terrain. If you’re a tall person you don’t want to be stooped over lugging a cooler for any length of time. Likewise if you’re shorter you don’t want to be using a handle that’s way higher than your waist. Many of the best wheeled coolers, especially the vertical ones, incorporate a telescopic handle. Look out for those especially if more than one person is going to be using the unit. Though capacity, maneuvrability and cooling performance will likely be the most important considerations additional features can make all the difference when buying. What unique features does the cooler have? Bottle opener, drain hole, or perhaps drink trays within the lid? Which of these is important to you? 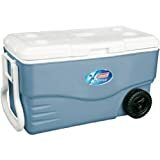 The Coleman 100 Quart Xtreme 5 Wheeled Cooler is capable of carrying more than 160 cans – the equivalent of six cases of soda- and comes equipped with what the company calls Xtreme 5 Technology. A technology it claims can keep ice for up to five days even in temperatures of 90 degrees or more. The cooler also comes with a two-way handle for easy carrying and hinged lid with cup holders for convenience. But is it any good? Let’s start with the bad. Ever since the company was founded more than 100 years ago, Coleman has prided itself on selling only the highest quality products. However, customers have found that the 100 Quart Xtreme has some surprising quality issues. The main problem is the quality of the fixings. There’s a tendency for the screws which hold the lid on to come out of the hinges. Worse still, this frequently occurs because the threads have been stripped. Meaning it’s difficult to repair the damage. But it’s not all bad news. Unlike many coolers with wheels and handles, the Coleman 100 Quart Xtreme 5 does hold ice for up to 5 days in high temperatures, as promised. Even when left out in the sun, the special insulation technology on the cooler appears to work wonders. When it comes to large coolers you often find people sitting on them. On this unit the position of the wheel is such that it only touches the ground once you lift the cooler at the front. So if you’ve got a couple of teens that want to sit on it they aren’t going to ruin the integrity of the box or break the wheel axle. Furthermore, the wheels are ideally designed to be dragged over rough terrain, providing excellent rolling characteristics. From a technological perspective, it’s clear that Coleman has done a great job with the 100 Quart Xtreme 5. 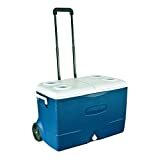 The wheeled cooler keeps drinks, ice and other food items cold for a miraculously extended period of time. With that said, the company seems to have skimped on quality to keep the price relatively low. There are problems with the handles, lid, and hinges which appear to contradict the notion that this is a cooler than can be used in a rugged environment. The unique selling point of the cooler is the cup holder lid, but this won’t be much use to the average camper if the cover is prone to breaking. Who should buy the Coleman Xtreme cooler? Mainly campers or tailgaters looking for lots of interior space at a relatively low price. Igloo claims that the Glide Pro Cooler will keep ice for up to 6 days in temperatures of 90 degrees. Tests of the Glide Pro prove that this claim is true: customers are able to enjoy cool food and beverages up to six days later, even after camping in hot weather. This is 1 more than the cheaper Coleman Xtreme and Rubbermaid models. The unique selling point of the cooler is its quality which is better than the other products discussed here. The extension handles are sturdy and come with a trigger release which allows them to quickly extend and contract. 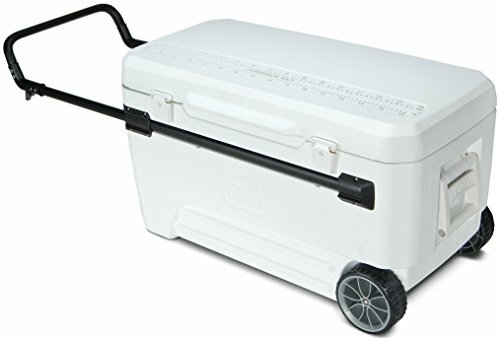 And the reliable lid, durable handles, and well-constructed wheels make this a great cooler to transport over rough terrain. Are there any downsides besides the price? Unfortunately, the nature of the design of the lid and the latches means that it can be difficult to close sometimes with the lid not quite mating properly. In a few isolated cases buyers have received the product with a broken handle. You should just check upon delivery and take advantage of return facilities from reputable retailers if there’s a problem. Igloo decided that they wanted to make a no-compromise cooler. As a result, the price is higher than the other models in this review, although not significantly so. With that said, this stylish cooler from Igloo is a great addition to any camping trip. Ultimately this is a product for people who go on regular camping or fishing trips that want a robust cooler that won’t let them down. The stainless steel hinges and latches are a real plus at this price point. Rubbermaid, like Igloo and Coleman, claims to have made a cooler with sufficient insulation to keep ice frozen for up to 5 days. 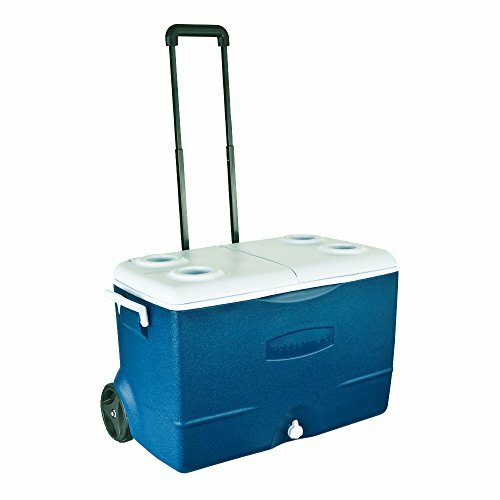 The Extreme 5-Day Wheeled Ice Chest Rolling Cooler will accommodate 130 cans, plus ice, and has a total capacity of 50 quarts. Regarding the positives, the Rubbermaid Extreme does exactly what the manufacturer claims: it will keep the contents cool for 5-days, so long as conditions are optimal. But what does “optimal mean?” In practice, it means cooling all contents beforehand and adding at least a pound of ice per quart of contents. For example, for a five-day trip, users need to take more than 40 pounds of ice. Another positive is that the Rubbermaid comes with antimicrobial protection, preventing the buildup of mold in the interior. This is a great addition, especially if the cooler is used in hot weather. The main downside of the Rubbermaid, like the Coleman, is the quality of the construction. In particular, the handle, despite its plastic and metal construction, is weak and prone to breakage. Furthermore, there are doubts as to the ability of the Rubbermaid to keep internal temperatures cool, especially for periods of longer than a couple of days when not used optimally. The Rubbermaid is a budget cooler with wheels and handles, but overall it’s let down by a variety of problems. The biggest problem is the fact that the handle is prone to breakage, despite the claim that the cooler’s wheels are designed for rough terrain. Who’s this cooler for? Mainly for people who are on a tight budget who can’t afford something more robust but also those who don’t need as much interior space or are going on short trips. 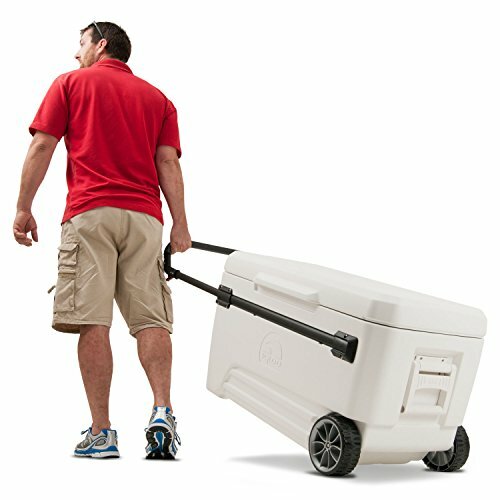 Conclusion – Which is The Best Wheeled Cooler with handle? The clear winner here is the Igloo Glide PRO Cooler, thanks to a combination of high build quality and excellent insulation. Unlike Coleman and Rubbermaid, Igloo gets the basics right, offering customers what they want most of all: a decent roller cooler that does the job. The runner up is the Coleman. Though there are build quality issues here, the Coleman does have excellent cooling performance. Both the Coleman and the Rubbermaid come with some great features, like antimicrobial lining and integrated drinks trays, but these features should be the cherry-on-top, not the core value proposition. The best coolers with wheels are easy to pull, durable with great cooling performance and here that’s the Igloo Glide Pro Cooler. Have you used any of these products? Or perhaps you’d like to propose an alternative for the best wheeled cooler accolade? If so use the comment section below. When people buy and review coolers you often hear wildly different results they’ve had in terms of cooling performance. Here are a few tips to get the best performance from your cooler and level the playing field. Cool the cooler! Before using the cooler give yourself the best chance of keeping things cold by starting with a cold cooler. If you can get access to a deep freezer or walk in cold storage then put it in the night before you need to use it – this is what the pro’s do before a 10 day fishing trip. Failing that just keep it out of the sun and put it in a dark place. Lastly packing the cooler with an initial bag of ice will cool things down from the inside. When buying your ice make sure it’s as dry as possible, that ice is much colder. Hunt out the ice container at the store that’s less used. Whatever you plan on putting in the cooler ensure it’s cold to begin with by putting it in the refrigerator over night. If you put in room temperature soda cans you’ll use all the energy in the ice to bring the temperature down. This will result in a 5 day rated cooler only last 2 or at best 3 days. When filling the cooler pack it as tightly as possible around your food stuffs with ice, don’t leave any air space. When retrieving drinks or snacks from your cooler do so as quickly as possible, then close the lid. Remember warm air is the enemy! Ensure your drain plug is tight and don’t drain the water out until you’ve finished using the cooler, this just lets the warmer air in. If possible when using the cooler keep it out of direct sunlight and in the shade. Many pro users even cover their coolers with a cheap space blanket to reflect more of those rays away. Cleaning your cooler inside and out is good practice for maintaining the look and keeping the inner surfaces mold and bacteria free. Here are a couple of methods for cleaning your cooler. For the outer surfaces of a hard case cooler, not a soft cooler, the best method for cleaning is to use a pressure washer. The plastic is durable enough to withstand this. You might want to go a little easier around the latches, seals and wheels so as not to damage them. Internally good old soap and water will be good enough for most situations. If you haven’t used your cooler for a while or if you have mold growth then you might want to introduce bleach into the mix. Wearing gloves mix 1 teaspoon of bleach with 1 quart of water. Sponge over the internal surfaces to kill bacteria and remove any deposits that cling to the walls. This is a really easy one. Once you’ve used your wheeled cooler just check that the wheels are free running and free from any mud, sand or debris. The axle should also be clean and every now and again applying a couple of drops of oil will keep things running smoothly. Lastly check that the caps that keep the wheels on the axle a fully seated in place. These have been known to come off on some models.